If you were one of the Virgin Media subscribers left temporarily devastated when the broadcaster had a falling-out with UKTV and briefly lost access to its channels, you'll be delighted to hear that Loewe is rolling out Freeview Play support to its TVs, protecting you from any such panic in future. Loewe customers with supported sets will soon be able to enjoy Dave, Gold and Eden – in addition to free and on-demand content from BBC iPlayer, ITV Hub, All 4 and Demand 5. 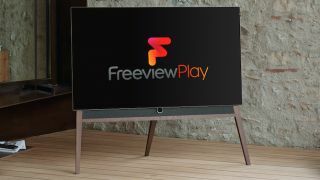 "Freeview Play is a fantastic addition to Loewe TVs," said Charlie Cann, marketing manager at Loewe UK Ltd. "Loewe customers can now enjoy the full suite of UK catch-up services, together with innovative features such as the backwards TV guide and recommendations, which consolidate content across all the services for an amazingly user-friendly experience." You won't get Dave before the new series of Taskmaster starts next week, but you can look forward to catching up when Freeview Play rolls out via a software update in October.